TeachPitch: where are they now? TeachPitch raised just over £300k last year on Crowdcube and has returned to raise additional follow-on investment from the crowd. We interviewed the founder to tell us more about the business and where it is now compared to last year. Tell us a bit more about the market you are in? TeachPitch is an Education Technology company operating in a fast growing market projecting to grow at 17% per annum, reaching $252bn by 2020 (EdTechX Global 2016). The same report also observes that to date, only 2% of the entire education market has been digitised, creating a massive opportunity for those players that offer technology tools and services in this sector. Even though the US has set the trend and pace of the EdTech market thus far, Asia is now experiencing the world's fastest growth in investment into the sector. This is something that has not gone by unnoticed by TeachPitch. Over the past year, we have concentrated in Asia, mainly in China and I am happy to say that this strategy has paid off. What has happened after closing your round on Crowdcube? A lot has happened since our round on Crowdcube last year. After having raised over £300,000 from more than 157 investors in April 2016, a lot of opportunities opened up to us. Some of these – like our growth and traction in China was indeed unexpected. Our main focus was on growing commercially by starting the conversation with leads that could make the decision for more than one school or institution at a time. Such clients are more often present in the East than in the West and so we focused our commercial efforts there. But we did not expect this to happen so quickly. Our journey eastwards provided us with great new partners, clients and colleagues, who can help us to further build our brand in China. Other than that, we feel very fortunate to have received a positive response from the public. The support we received from the Qatar Foundation through the World Innovation Summit for Education was amazing. It was quite an honour to receive acknowledgement as one of the 50 best tech companies in the United Kingdom by the Great British Entrepreneur Awards. What have been the highlights of the past year? Even though there have been many highlights over the last year, the growth opportunities for our business in China has been most surprising. Partnering with established universities, such as Tsinghua University (the no. 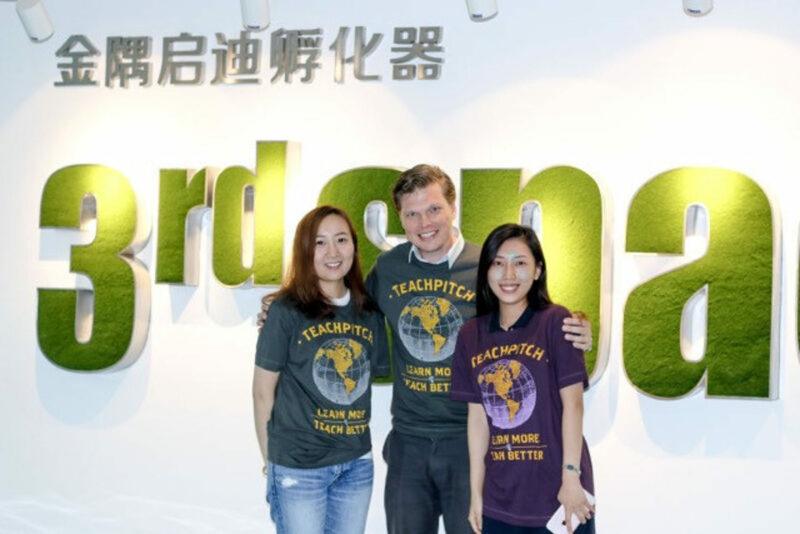 1 technical university in the country with whom we opened our office in Beijing) has shown, not only the appetite for TeachPitch but also opened doors to potential investors and helped close some very big customers. To give some concrete examples, AIDI, one of the biggest international schools in Beijing is already our client and we are currently closing a commercial deal with a major education company that will allow our technology to be used in over 500 schools in China. Another partner we are going to work with is currently developing an international curriculum (organised & disseminated through TeachPitch) that will simultaneously be used in more than 100 schools – so needless to say that we can really achieve scale by working in China. Another highlight has been our further growth in users (our system is currently being used by tens of thousands of users in over 130 countries) and you really cannot put a price on the ideas they have given us in further developing our platform and products. I am genuinely grateful that TeachPitch has grown to the next level and very much looking forward to making the next step! As a sole founder, I sometimes fear to be too thinly spread. Our team is growing, currently operating from 3 locations, but many in our company are still working very long hours to get everything developed and delivered on time. As I feel responsible for everything, I have a desire to be included in a lot of projects that are happening, which increasingly is becoming less and less possible. As I don’t want to be a hindrance in the growth of my own business, I am trying more and more to delegate and only touch base with key people in our team when necessary. I always try to be very honest with everyone in the team about what I am doing and what my perception is and notice that this helps. There is nobody in the team who expects me to be perfect. It is not always easy for me but I hope I am getting better at it. Next to our commercial growth, mainly in Asia, we will also focus on the implementation of more Machine Learning functionalities into our software. As developers, we really want to grow with our users and make sure that the technology on what our platform is built truly understands them. We are continuously working on ensuring that our software learns from all the data that our users generate and leave behind, so our software can continuously suggest new material based on crucial functions such as user learning interest, search behaviour, location, previous content usage, etc. We see it as an integral part of our mission to develop TeachPitch as a search engine that continuously becomes more intelligent. We are really looking forward to building a wide range of new applications and algorithms around our users and the content that we have curated to help educators and schools worldwide with the discovery of the most relevant learning material at the right moment in time. I feel very fortunate that TeachPitch will also become a part of the Educate Project, a £4.5 million fund initiated by the European Union and The Knowledge Lab at UCL, through which we will receive support of a great number of UCL’s academic researchers who will help us with the development of such AI and Machine Learning applications. The journey up until today has been a true blessing and I feel very fortunate to be able to take things to the next level, working with a dedicated team that is committed to making TeachPitch a big success. You can find out more about TeachPitch and the investment opportunity by visiting the pitch page today.